Glass's compositions have been described as minimal music, similar to other "minimalist" composers including La Monte Young, Steve Reich and Terry Riley. However, Glass has described himself instead as a composer of "music with repetitive structures", which he has helped evolve stylistically. 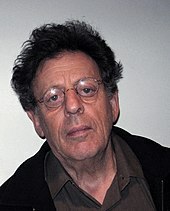 Glass founded the Philip Glass Ensemble, with which he still performs on keyboards. He has written numerous operas and musical theatre works, eleven symphonies, eleven concertos, seven string quartets and various other chamber music, and film scores. Three of his film scores have been nominated for Academy Awards. Glass built a sizable record collection from the unsold records in his father's store, including modern classical music such as Hindemith, Bartók, Schoenberg, Shostakovich and Western classical music including Beethoven's string quartets and Schubert's B♭ Piano Trio. Glass cites Schubert's work as a "big influence" growing up. He studied the flute as a child at the university-preparatory school of the Peabody Institute. At the age of 15, he entered an accelerated college program at the University of Chicago where he studied mathematics and philosophy. In Chicago he discovered the serialism of Anton Webern and composed a twelve-tone string trio. In 1954 Glass traveled to Paris, where he encountered the films of Jean Cocteau, which made a lasting impression on him. He visited artists' studios and saw their work; "the bohemian life you see in [Cocteau's] Orphée was the life I ... was attracted to, and those were the people I hung out with." Glass studied at the Juilliard School of Music where the keyboard was his main instrument. His composition teachers included Vincent Persichetti and William Bergsma. Fellow students included Steve Reich and Peter Schickele. In 1959, he was a winner in the BMI Foundation's BMI Student Composer Awards, an international prize for young composers. In the summer of 1960, he studied with Darius Milhaud at the summer school of the Aspen Music Festival and composed a violin concerto for a fellow student, Dorothy Pixley-Rothschild. After leaving Juilliard in 1962, Glass moved to Pittsburgh and worked as a school-based composer-in-residence in the public school system, composing various choral, chamber and orchestral music. In 1964, Glass received a Fulbright Scholarship; his studies in Paris with the eminent composition teacher Nadia Boulanger, from autumn of 1964 to summer of 1966, influenced his work throughout his life, as the composer admitted in 1979: "The composers I studied with Boulanger are the people I still think about most—Bach and Mozart." Shortly after arriving in New York City in March 1967, Glass attended a performance of works by Steve Reich (including the ground-breaking minimalist piece Piano Phase), which left a deep impression on him; he simplified his style and turned to a radical "consonant vocabulary". Finding little sympathy from traditional performers and performance spaces, Glass eventually formed an ensemble with fellow ex-student Jon Gibson, and others, and began performing mainly in art galleries and studio lofts of SoHo. The visual artist Richard Serra provided Glass with Gallery contacts, while both collaborated on various sculptures, films and installations; from 1971 to 1974 he became Serra's regular studio assistant. With 1+1 and Two Pages (composed in February 1969) Glass turned to a more "rigorous approach" to his "most basic minimalist technique, additive process", pieces which were followed in the same year by Music in Contrary Motion and Music in Fifths (a kind of homage to his composition teacher Nadia Boulanger, who pointed out "hidden fifths" in his works but regarded them as cardinal sins). Eventually Glass's music grew less austere, becoming more complex and dramatic, with pieces such as Music in Similar Motion (1969), and Music with Changing Parts (1970). 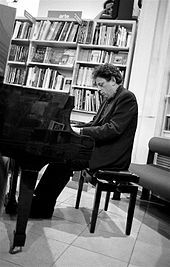 These pieces were performed by The Philip Glass Ensemble in the Whitney Museum of American Art in 1969 and in the Solomon R. Guggenheim Museum in 1970, often encountering hostile reaction from critics, but Glass's music was also met with enthusiasm from younger artists such as Brian Eno and David Bowie (at the Royal College of Art ca. 1970). Eno described this encounter with Glass's music as one of the "most extraordinary musical experiences of life", as a "viscous bath of pure, thick energy", concluding "this was actually the most detailed music I'd ever heard. It was all intricacy, exotic harmonics". In 1970 Glass returned to the theatre, composing music for the theatre group Mabou Mines, resulting in his first minimalist pieces employing voices: Red Horse Animation and Music for Voices (both 1970, and premiered at the Paula Cooper Gallery). Glass continued his work with a series of instrumental works, called Another Look at Harmony (1975–1977). For Glass this series demonstrated a new start, hence the title: "What I was looking for was a way of combining harmonic progression with the rhythmic structure I had been developing, to produce a new overall structure. (...) I'd taken everything out with my early works and it was now time to decide just what I wanted to put in—a process that would occupy me for several years to come." Parts 1 and 2 of "Another Look at Harmony" were included in a collaboration with Robert Wilson, a piece of musical theater later designated by Glass as the first opera of his portrait opera trilogy: Einstein on the Beach. Composed in spring to fall of 1975 in close collaboration with Wilson, Glass's first opera was first premiered in summer 1976 at the Festival d'Avignon, and in November of the same year to a mixed and partly enthusiastic reaction from the audience at the Metropolitan Opera in New York City. Scored for the Philip Glass Ensemble, solo violin, chorus, and featuring actors (reciting texts by Christopher Knowles, Lucinda Childs and Samuel M. Johnson), Glass's and Wilson's essentially plotless opera was conceived as a "metaphorical look at Albert Einstein: scientist, humanist, amateur musician—and the man whose theories (...) led to the splitting of the atom", evoking nuclear holocaust in the climactic scene, as critic Tim Page pointed out. As with Another Look at Harmony, "Einstein added a new functional harmony that set it apart from the early conceptual works". Composer Tom Johnson came to the same conclusion, comparing the solo violin music to Johann Sebastian Bach, and the "organ figures (...) to those Alberti basses Mozart loved so much". The piece was praised by The Washington Post as "one of the seminal artworks of the century." Another series, Fourth Series (1977–79), included music for chorus and organ ("Part One", 1977), organ and piano ("Part Two" and "Part Four", 1979), and music for a radio adaption of Constance DeJong's novel Modern Love ("Part Three", 1978). "Part Two" and "Part Four" were used (and hence renamed) in two dance productions by choreographer Lucinda Childs (who had already contributed to and performed in Einstein on the Beach). "Part Two" was included in Dance (a collaboration with visual artist Sol LeWitt, 1979), and "Part Four" was renamed as Mad Rush, and performed by Glass on several occasions such as the first public appearance of the 14th Dalai Lama in New York City in Fall 1981. The piece demonstrates Glass's turn to more traditional models: the composer added a conclusion to an open-structured piece which "can be interpreted as a sign that he abandoned the radical non-narrative, undramatic approaches of his early period", as the pianist Steffen Schleiermacher points out. The "Portrait Trilogy" was completed with Akhnaten (1982–1983, premiered in 1984), a vocal and orchestral composition sung in Akkadian, Biblical Hebrew, and Ancient Egyptian. In addition, this opera featured an actor reciting ancient Egyptian texts in the language of the audience. Akhnaten was commissioned by the Stuttgart Opera in a production designed by Achim Freyer. It premiered simultaneously at the Houston Opera in a production directed by David Freeman and designed by Peter Sellars. At the time of the commission, the Stuttgart Opera House was undergoing renovation, necessitating the use of a nearby playhouse with a smaller orchestra pit. Upon learning this, Glass and conductor Dennis Russell Davies visited the playhouse, placing music stands around the pit to determine how many players the pit could accommodate. The two found they could not fit a full orchestra in the pit. Glass decided to eliminate the violins, which had the effect of "giving the orchestra a low, dark sound that came to characterize the piece and suited the subject very well." As Glass remarked in 1992, Akhnaten is significant in his work since it represents a "first extension out of a triadic harmonic language", an experiment with the polytonality of his teachers Persichetti and Milhaud, a musical technique which Glass compares to "an optical illusion, such as in the paintings of Josef Albers". A series of orchestral works originally composed for the concert hall commenced with the 3-movement Violin Concerto No. 1 (1987). This work was commissioned by the American Composers Orchestra and written for and in close collaboration with the violinist Paul Zukofsky and the conductor Dennis Russel Davies, who since then has encouraged the composer to write numerous orchestral pieces. The Concerto is dedicated to the memory of Glass's father: "His favorite form was the violin concerto, and so I grew up listening to the Mendelssohn, the Paganini, the Brahms concertos. (...) So when I decided to write a violin concerto, I wanted to write one that my father would have liked." Among its multiple recordings, in 1992, the Concerto was performed and recorded by Gidon Kremer and the Vienna Philharmonic Orchestra. This turn to orchestral music was continued with a symphonic trilogy of "portraits of nature", commissioned by the Cleveland Orchestra, the Rotterdam Philharmonic Orchestra, and the Atlanta Symphony Orchestra: The Light (1987), The Canyon (1988), and Itaipu (1989). Glass also returned to chamber music; he composed two String Quartets (No. 4 Buczak in 1989 and No. 5 in 1991), and chamber works which originated as incidental music for plays, such as Music from "The Screens" (1989/1990). This work originated in one of many theater music collaborations with the director JoAnne Akalaitis, who originally asked the Gambian musician Foday Musa Suso "to do the score [for Jean Genet's "The Screens"] in collaboration with a western composer". Glass had already collaborated with Suso in the film score to Powaqqatsi (Godfrey Reggio, 1986). Music from "The Screens" is on occasion a touring piece for Glass and Suso (one set of tours also included percussionist Yousif Sheronick ), and individual pieces found its way to the repertoire of Glass and the cellist Wendy Sutter. Another collaboration was a collaborative recording project with Ravi Shankar, initiated by Peter Baumann (a member of the band Tangerine Dream), which resulted in the album Passages (1990). In the late 1980s and early 1990s, Glass's projects also included two highly prestigious opera commissions, based on the life of two explorers, Christopher Columbus (The Voyage (1990), commissioned by the Metropolitan Opera, with a libretto by David Henry Hwang), and Vasco da Gama (White Raven) (1991), a collaboration with Robert Wilson and composed for the closure of the 1998 World Fair in Lisbon. Especially in The Voyage, the composer "explorenew territory", with its "newly arching lyricism", "Sibelian starkness and sweep", and "dark, brooding tone (...) a reflection of its increasingly chromatic (and dissonant) palette", as one commentator put it. For the second opera, La Belle et la Bête (1994, scored for either the Philip Glass Ensemble or a more conventional chamber orchestra), Glass replaced the soundtrack (including Georges Auric's film music) of Cocteau's film, wrote "a new fully operatic score and synchronizeit with the film". The final part of the triptych returned again to a more traditional setting with the "Dance Opera" Les Enfants Terribles (1996), scored for voices, three pianos and dancers, with choreography by Susan Marshall. The characters are depicted by both singers and dancers. The scoring of the opera evokes Bach's Concerto for Four Harpsichords, but in another way also "the snow, which falls relentlessly throughout the opera (...) bearing witness to the unfolding events. Here time stands still. There is only music, and the movement of children through space" (Glass). In the late 1990s and early 2000s, Glass's lyrical and romantic styles peaked with a variety of projects: operas, theatre and film scores (Martin Scorsese's Kundun, 1997, Godfrey Reggio's Naqoyqatsi, 2002, and Stephen Daldry's The Hours, 2002), a series of five concerts, and three symphonies centered on orchestra-singer and orchestra-chorus interplay. Two symphonies, Symphony No. 5 "Choral" (1999) and Symphony No. 7 "Toltec" (2004), and the song cycle Songs of Milarepa (1997) have a meditative theme. The operatic Symphony No. 6 Plutonian Ode (2002) for soprano and orchestra was commissioned by the Brucknerhaus, Linz, and Carnegie Hall in celebration of Glass's sixty-fifth birthday, and developed from Glass's collaboration with Allen Ginsberg (poet, piano – Ginsberg, Glass), based on his poem of the same name. Two months after the premiere of this opera, in November 2005, Glass's Symphony No. 8, commissioned by the Bruckner Orchestra Linz, was premiered at the Brooklyn Academy of Music in New York City. After three symphonies for voices and orchestra, this piece was a return to purely orchestral and abstract composition; like previous works written for the conductor Dennis Russell Davies (the 1992 Concerto Grosso and the 1995 Symphony No. 3), it features extended solo writing. Critic Allan Kozinn described the symphony's chromaticism as more extreme, more fluid, and its themes and textures as continually changing, morphing without repetition, and praised the symphony's "unpredictable orchestration", pointing out the "beautiful flute and harp variation in the melancholy second movement". Alex Ross, remarked that "against all odds, this work succeeds in adding something certifiably new to the overstuffed annals of the classical symphony. (...) The musical material is cut from familiar fabric, but it's striking that the composer forgoes the expected bustling conclusion and instead delves into a mood of deepening twilight and unending night." The Passion of Ramakrishna (2006), was composed for the Pacific Symphony Orchestra, the Pacific Chorale and the conductor Carl St. Clair. The 45 minutes choral work is based on the writings of Indian Spiritual leader Sri Ramakrishna, which seem "to have genuinely inspired and revived the composer out of his old formulas to write something fresh", as one critic remarked, whereas another noted "The musical style breaks little new ground for Glass, except for the glorious Handelian ending (...) the "composer's style ideally fits the devotional text". A cello suite, composed for the cellist Wendy Sutter, Songs and Poems for Solo Cello (2005–2007), was equally lauded by critics. It was described by Lisa Hirsch as "a major work, (...) a major addition to the cello repertory" and "deeply Romantic in spirit, and at the same time deeply Baroque". Another critic, Anne Midgette of The Washington Post, noted the suite "maintains an unusual degree of directness and warmth"; she also noted a kinship to a major work by Johann Sebastian Bach: "Digging into the lower registers of the instrument, it takes flight in handfuls of notes, now gentle, now impassioned, variously evoking the minor-mode keening of klezmer music and the interior meditations of Bach's cello suites". Glass himself pointed out "in many ways it owes more to Schubert than to Bach". Appomattox, an opera surrounding the events at the end of the American Civil War, was commissioned by the San Francisco Opera and premiered on October 5, 2007. As in Waiting for the Barbarians, Glass collaborated with the writer Christopher Hampton, and as with the preceding opera and Symphony No. 8, the piece was conducted by Glass's long-time collaborator Dennis Russell Davies, who noted "in his recent operas the bass line has taken on an increasing prominence,(...) (an) increasing use of melodic elements in the deep register, in the contrabass, the contrabassoon—he's increasingly using these sounds and these textures can be derived from using these instruments in different combinations. (...) He's definitely developed more skill as an orchestrator, in his ability to conceive melodies and harmonic structures for specific instrumental groups. (...) what he gives them to play is very organic and idiomatic." Other works for the theater were a score for Euripides' The Bacchae (2009, directed by JoAnne Akalaitis), and Kepler (2009), yet another operatic biography of a scientist or explorer. The opera is based on the life of 17th century astronomer Johannes Kepler, against the background of the Thirty Years' War, with a libretto compiled from Kepler's texts and poems by his contemporary Andreas Gryphius. It is Glass's first opera in German, and was premiered by the Bruckner Orchestra Linz and Dennis Russell Davies in September 2009. LA Times critic Mark Swed and others described the work as "oratorio-like"; Swed pointed out the work is Glass's "most chromatic, complex, psychological score" and the "The orchestra dominates (...) I was struck by the muted, glowing colors, the character of many orchestral solos and the poignant emphasis on bass instruments". Glass's recently completed and projected works include Symphony No. 9 (2010–2011), Symphony No. 10 (2012), Cello Concerto No. 2 (2012, based on the film score to Naqoyqatsi) as well as String Quartet No. 6 and No. 7. Glass's Ninth Symphony was co-commissioned by the Bruckner Orchestra Linz, the American Composers Orchestra and the Los Angeles Philharmonic Orchestra. The symphony's first performance took place on January 1, 2012, at the Brucknerhaus in Linz, Austria (Dennis Russell Davies conducting the Bruckner Orchestra Linz); the American premiere was on January 31, 2012, (Glass's 75th birthday), at Carnegie Hall (Dennis Russell Davies conducting the American Composers Orchestra), and the West Coast premiere with the Los Angeles Philharmonic under the baton of John Adams on April 5. Glass's Tenth Symphony, written in five movements, was commissioned by the Orchestre français des jeunes for its 30th anniversary. The symphony's first performance took place on August 9, 2012 at the Grand Théâtre de Provence (fr) in Aix-en-Provence under Dennis Russell Davies. His 11th symphony, commissioned by the Bruckner Orchestra Linz, the Istanbul International Music Festival, and the Queensland Symphony Orchestra, premiered on January 31, 2017, Glass's 80th birthday, at Carnegie Hall, Dennis Russell Davies conducting the Bruckner Orchestra. Glass describes himself as a "classicist", pointing out he is trained in harmony and counterpoint and studied such composers as Franz Schubert, Johann Sebastian Bach, and Wolfgang Amadeus Mozart with Nadia Boulanger. Aside from composing in the Western classical tradition, his music has ties to rock, ambient music, electronic music, and world music. Early admirers of his minimalism include musicians Brian Eno and David Bowie. In the 1990s, Glass composed the aforementioned symphonies Low (1992) and Heroes (1996), thematically derived from the Bowie-Eno collaboration albums Low and "Heroes" (composed in late 1970s Berlin). Glass is the first cousin once removed of Ira Glass, host of the nationally syndicated radio show This American Life. Ira interviewed Glass onstage at Chicago's Field Museum; this interview was broadcast on NPR's Fresh Air. Ira interviewed Glass a second time at a fundraiser for St. Ann's Warehouse; this interview was given away to public radio listeners as a pledge drive thank you gift in 2010. Ira and Glass recorded a version of the composition Glass wrote to accompany his friend Allen Ginsberg's poem "Wichita Vortex Sutra."